The Alfred Lab: Learners experience life as Alfred, a 74-year old African American male with macular degeneration and hearing loss. The Beatriz Lab: A Journey Through Alzheimer’s Disease. The learner becomes, Beatriz, a middle-late aged Latina woman who transitions from early to middle to late stages of Alzheimer’s disease. The Clay Lab: End of Life Conversations. Learners become Clay, a 66-year old male, with a terminal diagnosis whose experiences include receiving a terminal diagnosis, hospice care at home, and the active dying process at the end-of-life. With intentional integration in the nursing curriculum, nursing students have been experiencing the Alfred and Beatriz labs over the past three semesters in their medical/surgical nursing courses, completing anonymous pre- and post- surveys. The Clay lab was introduced this spring semester to both sophomore and senior level students, who also have been asked to complete pre- and post-surveys. Using best practices defined for simulated experiences by the International Nursing Association for Clinical Simulation & Learning, the students are provided a brief overview of the VR simulation and learning objectives prior to starting the Embodied Lab; and after the VR experience, a debriefing discussion is conducted to enhance reflective learning. In the Beatriz labs, student responses (N=146) demonstrated equivalent to improved knowledge and increased confidence in caring for a patient with Alzheimer’s Disease. Most significant was a 22% mean increase from pre- to post-survey student responses rating confidence level (5-point Likert scale) in caring for a patient with early or mid-stages of Alzheimer’s disease, and 32% mean increase in caring for a patient with late-stages of Alzheimer’s disease. Newly introduced this semester are the Clay labs. Students were asked to rate comfort on a scale of 1-10 responding to the statement “I am comfortable talking about issues related to the end of life.” Mean pre-survey to post-survey scores increased from 5.723 to 6.043. When asked to rate confidence on scale of 1 to 10 responding to the statement “I feel confident in my ability to provide care to someone in the last weeks of their life”, mean scores increased from 5.660 to 6.319. Students were also asked to rate the impact of this virtual experience on a scale of 1 to 10 in the post-survey, with 10 being the most positive impact, the mean score was 8.809. 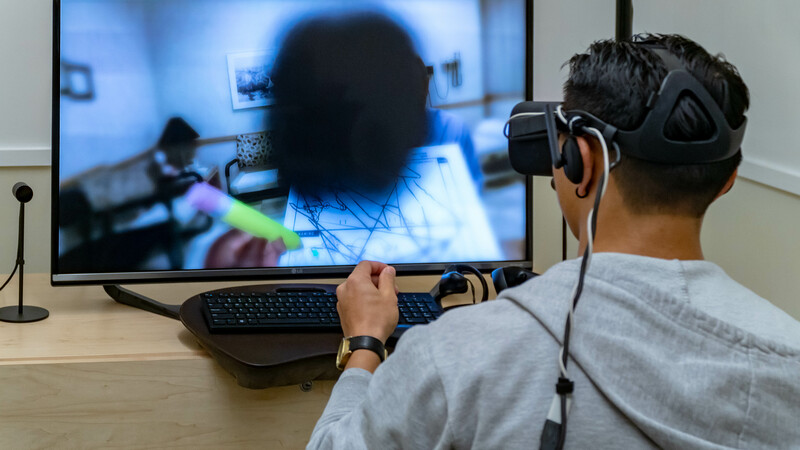 Virtual embodiment has shown high impact on learning about the disease processes and, just as or more importantly, gaining empathy for those and their loved ones affected by disease conditions. Our hope is to continue integrating virtual reality in nursing as Embodied Labs plans to launch more scenarios in the future. In partnership with Kristin Jordan to dive deeper into the data, we will be sharing more about our findings at OLC Innovate 2019 and at the ATI Nurse Educator Summit in April 2019. If you are interested in the discussing possibilities for virtual or mixed reality student experiences or learning more about CI Nursing using Embodied Labs, reach out to Dr. Jaime Hannans, Dr. Colleen Nevins, Ben Hytrek, or the Teaching and Learning Innovations team.